Android mobile devices provide two cameras, one at the backside and one at the front. When you take a picture with the front or the back camera, the mobile saves the image into two folders, DCIM, and camera. DCIM stores pictures you’ve captured with the help of third-party apps, screenshots, etc. Camera folder saves the output of the imaging hardware in the phone. Depending on your phone’s storage capacity, Android may save 1000s of images or videos to these two folders. Imagine you’ve saved several hundred pictures to your device. Will you use the file browser or explorer to go through the pics one after another? The answer is no. To overcome this problem, Android OS provides a gallery app. The gallery application is a smart tool that organizes every image saved on the storage memory or MicroSD card. It does so to provide a pleasant experience to the users. Apart from providing thumbnail views of the images, the Android Gallery app provides users with filters, sorting functions, and more. In case your phone runs on the outdated version of Android and you’re looking forward to replacing the old gallery app with a newer one, go through our list of best gallery apps for Android. Photos: Here, you’ll find a list of thumbnails grouped by the date. The interface enables users to scroll down and view older images. Online: With this interface, you can sync your pictures with cloud storage providers like Dropbox, Amazon Cloud or to your Facebook album. Hide, rename or delete the album or create its backup copy. Users must long press on an album to access the above functions. The A+ Android gallery app allows you to see the pictures in a list or in a grid. It has the option to sort the images and albums by their name or date in ascending or descending order. By default, the A+ gallery app uses the dark theme. You can change the theme from the settings panel of the application. Fast, lightweight 3.9 MP APK size. Essential features i.e. scroll, scan pictures. Only three free color themes. 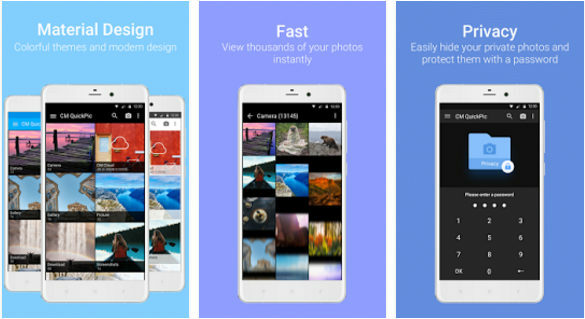 Piktures is a powerful Android gallery application that offers a great user experience. It has a stunning UI. The app shows small thumbnails of all images saved on your mobile phone in its main interface. It supports calendar view mode that lets users recollect the old good memories they’ve captured with the camera of the smartphone. Piktures provides a location filter that allows users to filter pictures by cities they’ve visited. The app displays local albums when you swipe on the right side of the screen. It supports cloud syncing. Piktures gives users access to a secret drive/folder where they can store private pictures or videos. 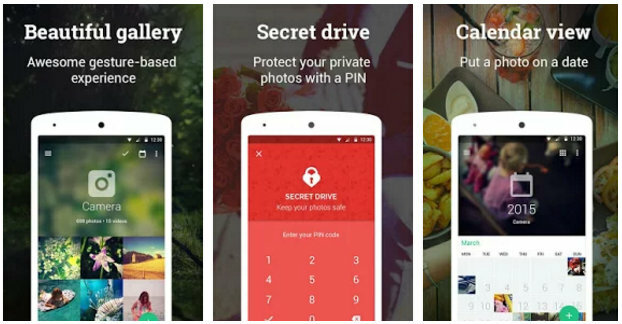 As in Android App Lock tools, you can lock the secret folder with a PIN code in the Piktures app. Option to hide the album, change its grid size and define a sort method. Link album to the home screen. Enable or disable album cover or parallax effect in it. Define maximum brightness for a video. Apps introduced by Google come pre-installed with most of the Android phones. Hence, it is likely that Google Photos might be installed on your device, but you’re not aware of it. 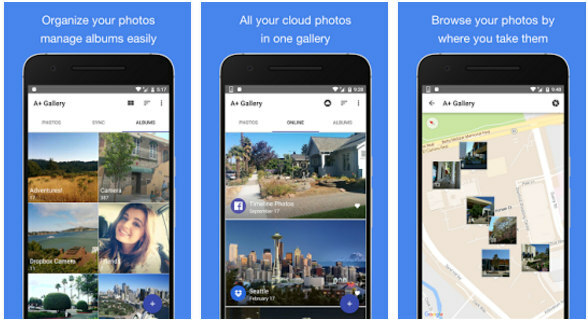 Google Photos is a great application for the people who are looking for a simple gallery app with which they can back up their videos and pictures to Google Drive. GP categorizes your pictures automatically and it provides a scroll bar for locating old albums and images. The app offers the visual search function. It lets you create animations, collages, panoramas from the pictures. The gallery app from Google ships with a photo editing tool. It allows users to see their images and videos on the television. 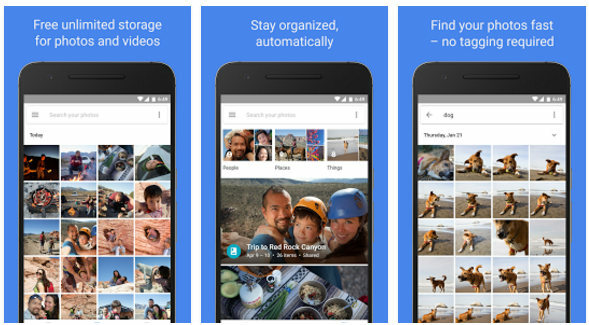 Google Photos allows you to save unlimited high-quality images on a cloud disk for free. QuickPick is a small and feature packed gallery application developed and maintained by CM, the firm behind a bunch of popular apps for Android. E.g. CM Launcher 3D. QP is an innovative application based on material design. It has a modern UI, which gives a refreshing look to your device. QuickPic is a fast application. It has the option to hide and password protect pictures/videos in the album. The app supports cloud sync. It also offers a picture editor tool. 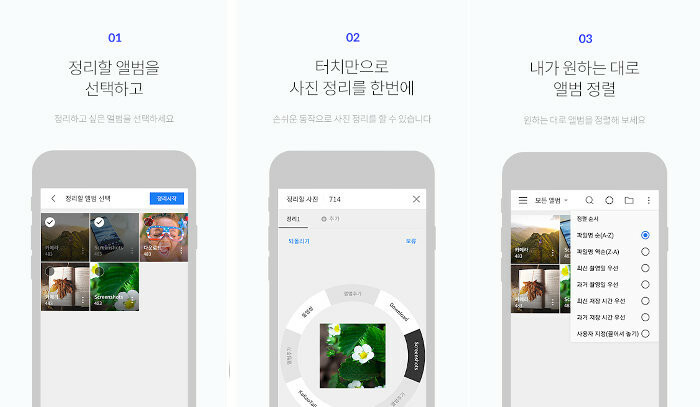 Foto is a lightweight Android gallery app developed by Gion Labs. Its size is around 6 megabytes. Foto requires permission to read/write photos and videos. The app supports two color themes – dark and light. You can configure it to display 3 or 2 thumbnails in a row. If you don’t want to see the thumbnails, you can switch to list view in the Foto app. Foto allows you to organize albums. It provides sort and search option. The app includes a Gallery Optimization tool that can fix the duplicate albums ad corrupted/broken images error on the phone. Foto supports around 20 languages. It has a built-in video player utility and an image editing tool. Foto allows you to see the slideshow of pictures. You can tag images/videos and move albums from the ROM to the MicroSD card with it. Conclusion: If you don’t like the existing gallery app on your mobile phone or tablet, download one of the above applications and say goodbye to old features. A PG in CS, Pramod loves reviewing Android applications. Spotify app review: Better than other music streaming services? © Content copyrighted! Reproduction is not allowed.